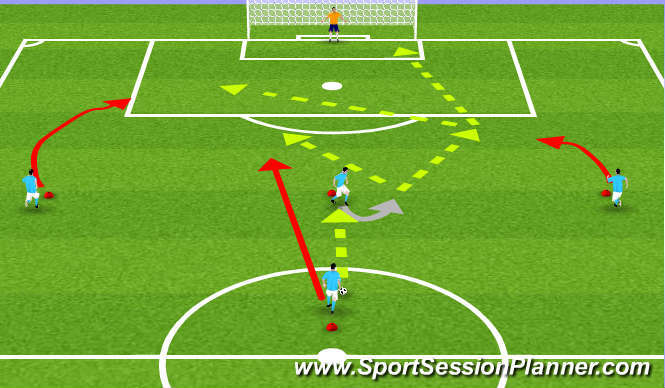 Set Up: 30 yards from goal are three cones designating LS/PS/RS positions, and 40 yards out is the CM position. Activity: CM starts with ball. CM passes ball out to PS who checks away, then checks to. CM then sprints forward to penetrate defenders. PS striker takes a negative touch away from CB, and then can either take positive touch towards RS to play a through ball, or can cut ball back and play through ball to CM or LS. Alternate sides. Progress to using defenders to make it game like, and add in Holding CM for drop support to PS. Coaching Points: Pass from CM to PS dictates which way PS must turn, PS must check shoulder to see which way CB attacks from, through ball must be played with proper weight, CM must sprint up and close past CB, LS and RS must time and bend their runs.